One for all, all mobile devices powered by one USB PD Type C charger | FSP TECHNOLOGY INC.
【Taipei, Sep.27, 2018】Normally, the various ICT devices are designed with exclusive power supplies according to the design power, local supply mains of various places or the different sizes for the device charging hole. The diversification in power supplies often result in hassles for users when charging different devices. Moreover, along with the evolution and replacement of the various types of chargers, a significant amount of electronic waste materials is further produced, bringing impact to the ecological environment. In order for chargers to become interworking and universal, the European Parliament pioneered in passing the draft for chargers, requesting uniform standard chargers to be adopted within the EU. In order for the charging accessories of ICT devices on the market to become simplified and increase their Interoperability as well as reduce the issue on waste of resources, the industry members of Digital Europe announced the 2nd version MOU (Memorandum of Understanding) during the first season of 2018, adopting uniform USB Type-C specs for mobile device chargers including laptop computers, tablets as well as smart phones, etc. The USB-IF also devotes in the promotion of Power Delivery (PD) regulations structured in USB, allowing existing ICT devices to be able to complete data transfer as well as charging at the same time through the same USB cable. FSP saw the market demands and launched a series of Type-C USB PD (Power Delivery) chargers. The models include desktop type, wall mount type as well as multinational plug adapter. The product wattages are 45W/60W/100W, with the highest rated power for charging been increased to 100W (20V/5A) from the conventional USB 5W (5V/1A); the charging voltage and current may further detect the device automatically and adjust to the required charging spec automatically, which is capable of protecting users’ devices on top of saving energy. This product collection from FSP is suitable for the majority of ICT devices, for instance: 2.5W~7.5W small power mobile phones, digital cameras, external storage devices and VR devices, tablets, laptop computers, AIO computers and liquid crystal displays, as well as flat screen TV. It may further be applied for business purposes including mass storage facilities, sales terminal machines, set-top boxes and work stations, etc. The USB PD product collection from FSP conforms to USB PD 3.0 specs, which is compatible with the existing USB 2.0 and BC 1.2/1.1/1.0 charging regulations. Non-direction Type-C connector is adopted for the design, allowing various types of devices to fulfill the power supply needs through just one single USB cable. The entire product collection is designed with high power density characteristics including full range voltage input of 90V-264V, as well as compact size…etc., which is capable of further shortening the charging time for various devices while optimizing the convenience of portable applications. The FSP045-A1UP3 and FSP045-A1NP3 45W chargers further feature a volume of merely 50*50*28mm, and are designed with foldable plug for portability, which is a real space saver. 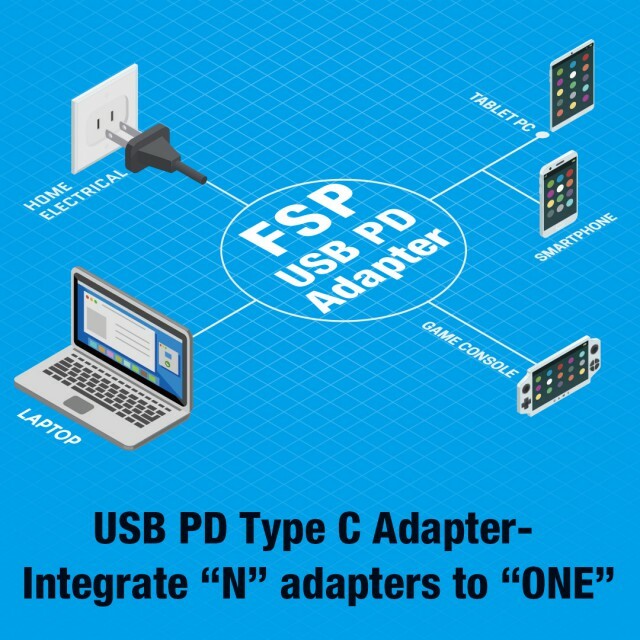 The Type-C USB PD product collection from FSP has integrated the charging cable for several types of electronic products into one simple charging accessory, allowing users to simplify their complicated living spaces.